Chester Police in Delaware County are being scrutinized after video of officers breaking up a St. Patrick's Day brawl went viral. It happened around 5 p.m. Saturday afternoon on the 900 block of East 16th Street. 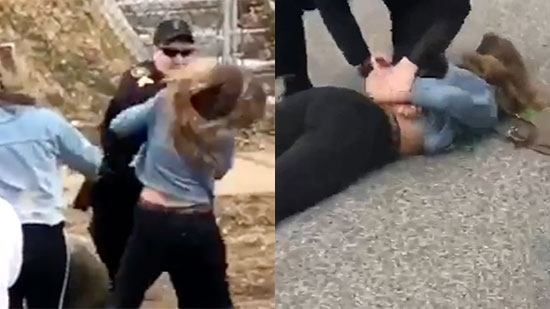 The video shows an officer strike 20-year-old Dominique Difiore in the head and throw her to the ground before placing her under arrest. It does look like Difiore hit the officer first. Three others were also arrested. Chester Police Department Chief James Nolan said, "A partial video of the event is circulating on various social media platforms. The incident, the video, and level of force used in connection with the event are all currently under investigation." He also said, "The phone cam video is just a part of a larger event." No one arrested was a Widener University student. The other three have been identified as 21-year-old Shawn Connelly, 20-year-old Tess Herman ,and 18-year-old Jaylene Westfall. New Jersey officials announced the arrest of 12 individuals for allegedly trafficking untraceable "ghost guns." The investigation began as detectives looked into a cocaine business, but expanded when they found the "ghost gun" dealings. The arrests were made between March 8-14 and the year-long investigation was dubbed Operation Stone Wall. New Jersey Attorney General Gurbir Grewal says four out of the 12 men arrested were charged with conspiring to sell untraceable AR-15 assault rifles. Ten were charged with distributing narcotics, primarily cocaine. A ghost gun is not registered and does not have a serial number, it is built using parts. Governor Phil Murphy signed a bill in November 2018 that makes it illegal to buy, sell, manufacture, or possess a ghost gun in the state. This is the first case brought under the new law. Pennsylvania's prison system is going tobacco-free starting this summer. On July 1st, all tobacco products will be banned inside a facility's secure perimeter. This will affect both inmates and staff. The policy applies to cigarettes, cigars, tobacco, tobacco substitutes, lighters, pipes, pipe cleaners, filters, rolling papers, roller aprons and rollers. Inmates and employees will be allowed to use non-refillable e-cigarettes that have been approved by the prison system, within designated areas. Corrections Secretary John Wetzel announced the policy on Monday, 3/18, citing positive test cases at three Pennsylvania state correctional institutions.